No matter how you look at it, holiday survival kits are something everyone should have on hand. But what do name tags have to do with survival kits? Plenty! From providing quick identification for holiday events to hosting the perfect party, name tags are a must to have on hand. These holiday survival kits help make your holiday plans run smoothly. Here are a few of our top products and why you need them for the holidays. Reusable name badges and badge holders are a must for all holiday survival kits! Adding things like adhesive name badges and badge holders to your holiday survival kits is sure to make your seasonal plans flow perfectly. Use these identification tools during party games and at any holiday event. From identification to buffet labels, these name badges are sure to meet all of your needs. Blank name tags are also a versatile product for use in your holiday survival kits. With a simple label or permanent marker, quickly turn these name tags into a solution for practically any job. From game pieces to table settings, we’re sure you won’t have a problem finding uses for these highly practical identification tools. Custom shape name tags are perfect for adding flair to your decorations. 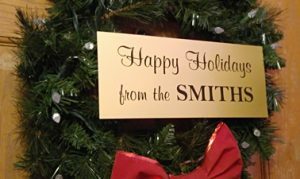 From a classic circle to something a bit fancier, add a personalized touch to your Christmas tree or other holiday decorations with custom shaped name tags. 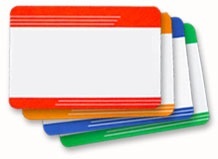 Or, add an extra bit of flair to your corporate name tags with a unique shape. A custom shaped name tag is a great way to draw attention to your company in a world of rectangle badges. You can also share them with your family and friends on your Christmas tree or by giving them away as presents. 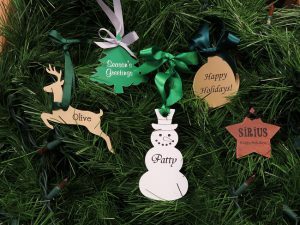 From holiday greetings to someone’s name, these creative holiday ornaments are sure to be a hit with anyone. Choose a color to match each shape, and we’ll engrave names or any other text you may want. Use custom signs for decorations in the home and office. Step up your decorating game by adding a custom sign to your door wreath. Or, add a sign to the buffet table or other party furnishings. From adding unique flair at the office to making decorations in your home a bit more exciting, using custom signs can be fun. And, they are easy to make. Choose a color to match your ideas of hosting the holidays or to go with a specific holiday theme. Then select the text you need. Use holiday quotes, a seasonal greeting or a family name. And, you can even add a custom logo or graphic. Holiday survival kits aren’t just for you, though. Create one for your colleagues and neighbors because they make perfect gifts.